Ontrol has recently released a Sedona driver that enables the R-ION programmable touch screen controller to take control of DMX lighting networks. 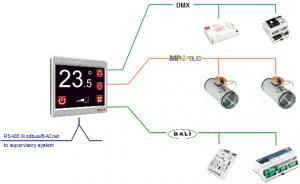 The addition of DMX to the previously available drivers (Modbus, BACnet, Dali, Belimo MP-Bus), takes the versatality of this capable controller to new levels. DMX512 (Digital Multiplex) is a standard for digital communication networks that are commonly used to control stage lighting and effects. In recent years however, DMX compatible dimmers and modules are becoming common for home automation, and in commercial building lighting control systems. Thanks to the universality of the Sedona™ Framework, the driver can also be run on the P-ION IP-based programmable plant controller. Contact us for further details..